South Georgian diving petrel Pelecanoides georgicus, photographed by Mike Danzenbaker. Contains: Pelagornithidae, Oceanitinae, Diomedea, Oceanodroma, Procellariinae, Fulmarinae. 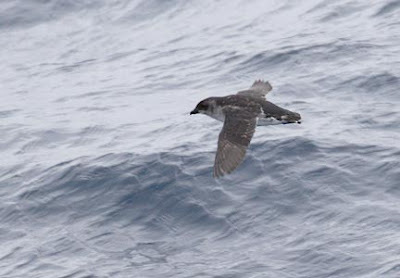 The Procellariiformes contain the tube-nosed seabirds: albatrosses, petrels and shearwaters. Members of the Procellariiformes have more or less tubular nostrils running along the basal part of the beak, and the front three toes connected by webs (Mayr et al. 2002). [S72] Simpson, G. G. 1972. Conspectus of Patagonian fossil penguins. American Museum Novitates 2488: 1-37.